By Amy Lewis | April 24, 2012. Mesmerising… That’s the best way to describe the experience of watching The Rialto Twirlers in training on a Saturday afternoon. As they twirl and toss their batons up high, the girls perform their lively synchronised routines, all while the pumping beat of pop music echoes around Donore Community Centre. It’s virtually impossible not to get sucked in by such an energetic and exciting display. Baton twirling or majorette clubs are no new phenomenon. The sport can be described as a mix between synchronised dancing and gymnastics, with the addition of baton twirls, tricks and throws. Baton twirling originated in the late 19th century as a form of rhythmic gymnastics, later becoming associated with marching bands during parades. However, since becoming a recognised Irish sport, baton twirling here has gained a modern twist, or should I say modern twirl. What was once a skill solely seen in parades has evolved into a competitive sport, with more and more majorette clubs springing up in Ireland and across the globe. Today, the sight of young majorettes practicing their tossing and twirling on the street is familiar to many. It is particularly common in inner-city Dublin where there are several majorette clubs, including the Liberties’ own Rialto Twirlers. The Rialto Twirlers began training ten years ago, taking over from the Fatima Majorettes. The club is run by Caroline Hollywood. Caroline’s involvement in the former club, the Liberettes, led her to where she is today. She runs the club alongside several other instructors, one of whom is her daughter Melissa McCoy. The club train four days a week, with different sessions for different age groups. 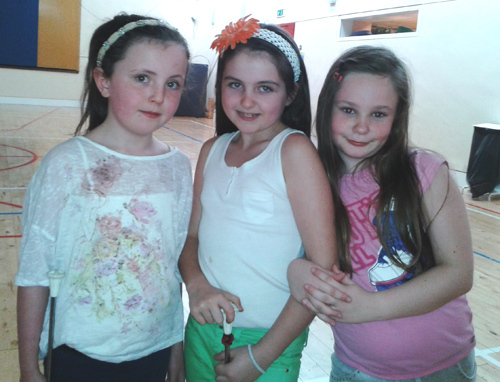 “We even have a Mammy’s group on a Thursday,” says Caroline. The Saturday session runs from 12pm to 5pm, with ages ranging from three to fourteen years. The class commences with the under fours. Their routines are simple enough but nevertheless, performed to perfection. 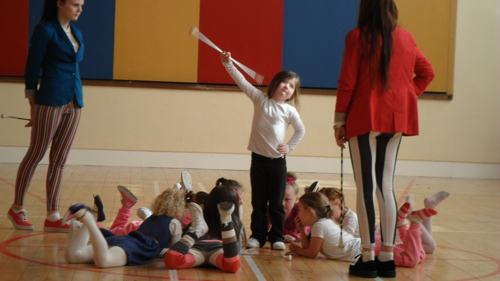 Although they’re of a young age, the sense of dedication and enthusiasm that the tiny twirlers have for the sport is incredible. As the day moves on, the older groups take to the floor. Each group’s routine is more advanced than the last, with more flips, more twirls, and more flamboyant moves – but certainly no less determination or energy. Instructors help to promote this enthusiasm. In every session, the relationship that the instructor has with their group is remarkable. As a result, the atmosphere is always very relaxed and positive. “Everybody has to smile,” one of the instructors tells her youngest group. 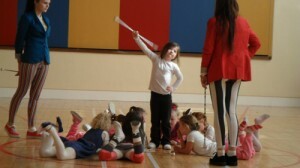 Like any typical class, the young majorettes listen to their teacher and do what they’re told. But this certainly isn’t a one-sided classroom; the teachers give their students just as much respect in return, often allowing them to take the lead and recite their routines themselves. Many people associate majorettes with the dramatic and colourful performances that are still a traditional part of the St. Patrick’s Day Parade. Others may liken it to cheerleading. However, there’s a lot more to being a majorette than sparkles and leotards. Behind the glamour exists hours of practice, plenty of dedication and some good old-fashioned hard work. This work is of no hardship to the Rialto Twirlers, who evidently get great pride and enjoyment out of what they do. Three of the majorettes, Nadine, Kirsty and Chardonnay were eager to perform their fast-paced routine for any spectators, and why wouldn’t they be? They have every reason to be proud of themselves, having spent many tiring Saturdays perfecting their moves. While the majorettes get to showcase their talent to the occasional spectator during their practice sessions, the competitions give them a real chance to shine. “We perform better at the competitions than at training,” says Caroline’s daughter Kerri, who has been a majorette since she was four. “We’re not as tired then and we get to wear our costumes,” she adds. The competitions are open to majorette clubs of all ages. In order to enter the competitions, a club must be a member of an association. The Rialto Twirlers are members of the Irish Majorette Association (I.M.A), an association that was set up by Councillor John Gallagher. 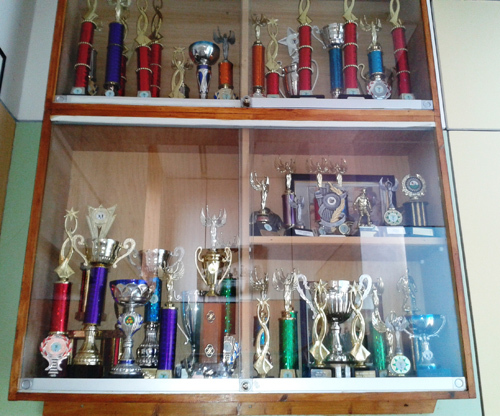 The Twirlers need only take a look at their trophy cabinet as a reminder that all of their training is worthwhile; it is bustling with shiny trophies, cups and medals. 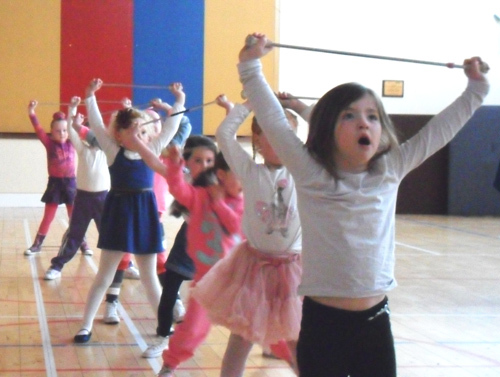 The thoughts of possible success are certainly an encouragement for all of the Rialto Twirlers, both young and old. Towards the end of their session, the under 6’s begin to get weary. “I can’t wait to go home to hibernate,” says one little girl with a cheeky smile. However, when the instructor reminds them of the looming competition, all tiredness is forgotten; the dainty dancers give a final performance of their routine, with more passion and energy than ever. Being a member of the Rialto Twirlers is about more than just winning. Much more. What is striking about the club is the sense of community that exists within it. The training sessions are a medley of family and friends where batons, skills and stories are shared. The Rialto Twirlers boast a kind of community spirit like no other and this has been the key to their previous string of successes. Regardless of future wins or losses, this community spirit will continue to be their number one prize, one that makes every member proud be a Rialto Twirler.